All menu ideas require minimum 24 hour notice to assure quality standards. 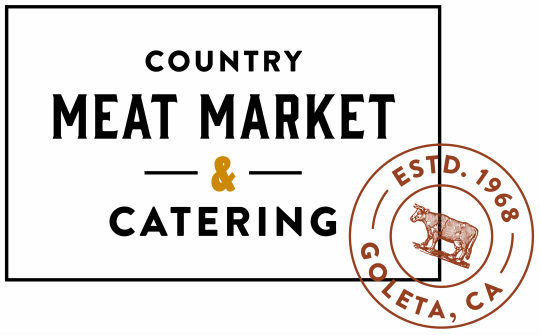 Please contact us directly for customized meal pricing and additional details about our full-service catering for your event . ​Vegetarian, and Vegan options available. Tri-Tip & BBQ. Chicken Combo: our famous baked beans, country potato salad, mixed field greens salad, balsamic and buttermilk ranch dressings, homemade garlic bread, and fresh made salsa. Oak Grilled Tri-Tip and Grilled Lobster Tail w/ Green garlic butter : Garlic roasted red potatoes, Grilled asparagus w/ lemon zest and sea salt, Housemade Caesar salad, and fresh baked sourdough rolls with butter. Kailua pork, Teriyaki chicken, Pineapple rice, Macaroni salad, sesame island slaw and hawaiian rolls and butter. 14 hr Roasted Prime Rib Dinner: garlic yukon gold mash with mushroom gravy, grilled asparagus, housemade caesar salad, fresh baked rolls with butter, served with au jus and our homemade horseradish sauce, carved at the serving table. WHAT'S BETTER N' STEAKS ON THE GRILL? 12oz Grilled Rib Eye or New York Steak Dinner (served medium-rare) w/ choice of chef's specialty sauces: garlic roasted red potatoes, grilled broccolini, arugula salad w/ lemon vinaigrette, and fresh baked rolls with butter.